Special Update, 17 November 2014. GOES-R IFR Probabilities on the morning of 30 January suggested the likelihood of fog along some of the Finger Lakes of upstate New York. These high probabilities arise because the Brightness Temperature Difference (10.7 µm – 3.9 µm) Product, below, shows a signal there. Note, however, that the Brightness Temperature Difference has a shadow; this is the sign that the co-registration error that is present between the 10.7 µm and 3.9 µm channels is producing a fictitious signal of fog over the lake. Such errors have been discussed here and elsewhere in the past. Evidence that fog is not present is available in Suomi/NPP data taken at the same time as the GOES data, above. 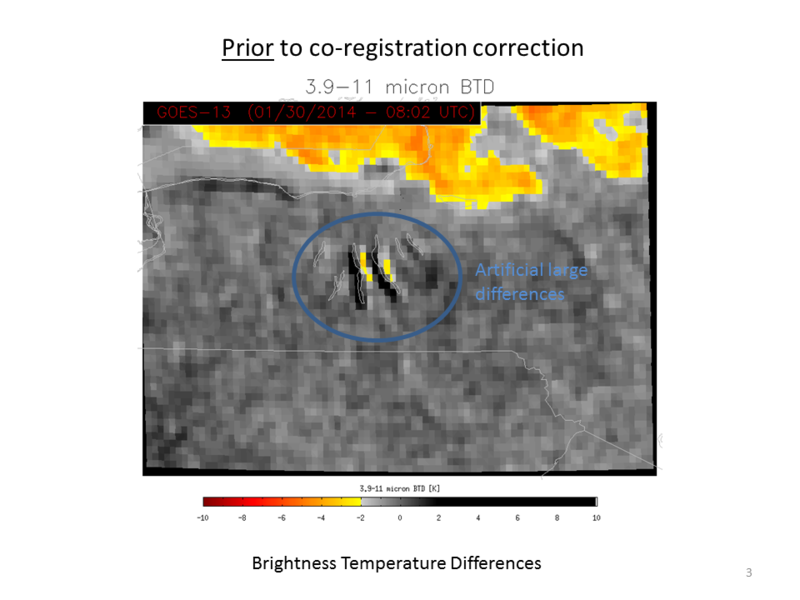 The toggle, below, of Day/Night Band imagery and of the brightness temperature difference (11.35 µm – 3.74 µm) from VIIRS shows scant evidence of fog/low stratus near the Finger Lakes. Because the moon is new, lunar illumination is at a minimum and surface features in the Day/Night band are not distinct, but the dark waters of the lakes are apparent. MODIS data also suggests no fog/low stratus in the region. Both the brightness temperature difference field and the MODIS-based IFR Probabilities, below, support a forecast that does not mention fog around the Finger Lakes. NOAA/NESDIS has tested a software fix to align better the longwave infrared (10.7 µm) and shortwave infrared (3.9 µm) channels. The toggle below is of the Brightness Temperature Difference Field with (After co-registration correction) and without (Prior to co-registration correction) the realignment. The correction of the co-registration error translates into more realistic IFR Probabilities in/around the Finger Lakes. In this case, IFR Probabilities are reduced because the false strong signal from the satellite is not present because of more accurate co-registration. This entry was posted in Error Explanations, Mid-Atlantic, MODIS, New England, Suomi/NPP on January 30, 2014 by Scott Lindstrom. One more example, above, showing the effects of extreme cold on the IFR Probability. IFR Probabilities correctly ignore the regions of low stratus in advance of the extreme cold air over Kansas and over the Ohio River Valley and Great Lakes. However, because of how the pseudo-emissivity is computed (See here also), and because the Rapid Refresh model show saturation in lower levels, regions with extreme cold will show a pixelated signal with noise. This entry was posted in Error Explanations, Northern Plains on January 27, 2014 by Scott Lindstrom. 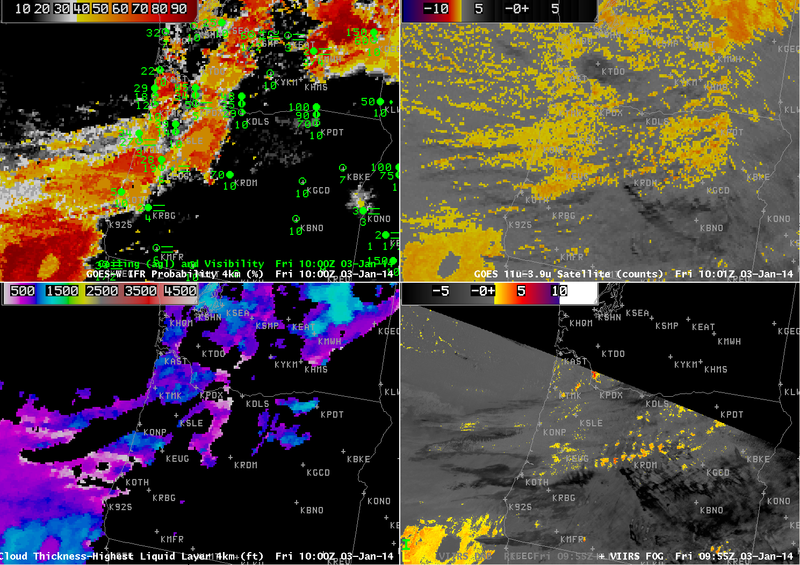 Suomi/NPP viewed eastern Oregon/Washington and western Idaho on two successive scans overnight. The 3/4 full moon provides ample illumination, and fog/low stratus is apparent in the imagery above. A view of the top of the clouds, however, gives little information about the cloud base, that is, whether or not important restrictions in visibility are occurring. For something like that, it is helpful to include surface-based data. Rapid Refresh data are fused with the model data to highlight regions where IFR conditions are most likely. The image below is a toggle of the 1053 UTC Day/Night band image and the 1100 UTC GOES-R IFR Probabilities (computed using GOES-West data). GOES-R IFR Probabilities are correctly highlighting regions where ceilings and visibilities are consistent with IFR conditions. Where the Day/Night band is possibly seeing elevated stratus (between The Dalles (KDLS) and Yakima (KYKM), for example), IFR Probabilities are lower. GOES-based data cannot resolve very small-scale fog events in river valleys (over northeastern Washington State, for example). The superior spatial resolution of a polar-orbiting satellite like Suomi/NPP (or Terra/Aqua) can really help fine-tune understanding of the horizontal distribution of low clouds. The stagnant weather pattern under the west coast ridge allowed fog to persist overnight on January 22nd, and once again, the Day/Night band observed the fog-filled Snake River Valley of southern Idaho. The newly-rising moon at 0854 UTC provided less illumination than the higher moon at 1034 UTC, but both show fog/low stratus over the Snake River Valley of Idaho, and over parts of northern Oregon and central Washington. It is difficult to tell where the stratus is close enough to the ground to produce IFR conditions, however. 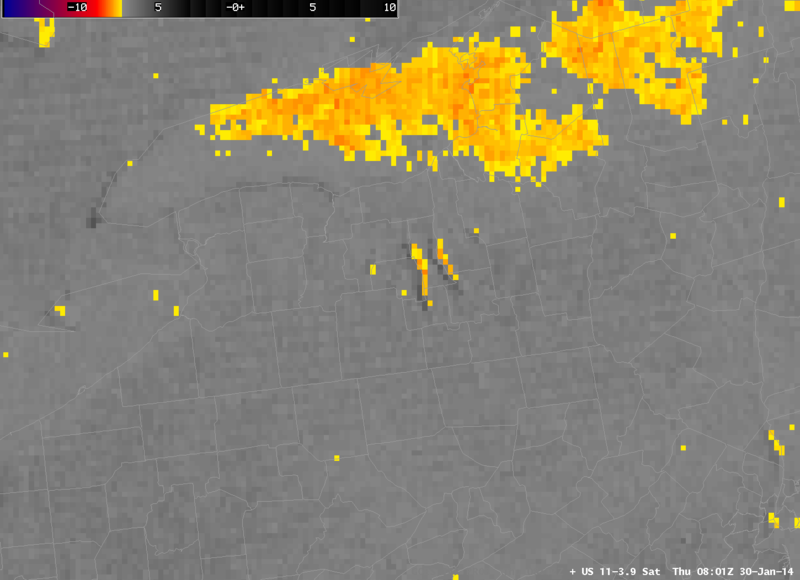 The brightness temperature difference product from VIIRS, above, can distinguish between low clouds (orange enhancement) and higher clouds (dark grey) because of the different emissivity properties of water-based low clouds and ice-based higher clouds. The toggle below shows how the higher-resolution VIIRS instrument can more accurately portray sharp edges to low clouds. Both instruments show the region of high clouds moving onshore in coastal Oregon (at the very very edge of the Suomi/NPP scan). These high clouds make satellite-detection of low clouds difficult because they mask detection of lower clouds. GOES-based IFR Probabilities show the probability of fog and low ceilings (IFR conditions) even where high clouds are present. In the toggle above, note the regions where the IFR Probability field is uniform (off the coast of Oregon, yellow, and over west-central Washington State, orange and yellow, both at 0900 UTC). These smooth fields are typical of IFR Probabilities that are determined primarily from Rapid Refresh data. Where those smooth fields exist, satellite data does not give a signal of low clouds — usually because of the presence of ice-based clouds at higher levels; therefore, model data are driving the IFR Probability signal, and model data are typically smoother than the more pixelated satellite field. There are places, however, where model data alone does not accurately portray IFR conditions (at KGPI, for example (Glacier Park), where high clouds are present). IFR Probability algorithms have not yet been extended using data from Suomi/NPP, in large part because the VIIRS instrument does not detect radiation in the so-called water-vapor channel (around 6.7 µm). The MODIS detector on board Terra and Aqua does have a water vapor channel, and IFR Probabilities are routinely produced from MODIS data, as shown below. MODIS, like VIIRS, has a 1-km pixel footprint that excels at detecting very fine small-scale features in clouds, especially small valleys, that are smeared out in the GOES imagery. The toggle below is of MODIS Brightness Temperature Difference, MODIS-based IFR Probabilities, GOES Brightness Temperature Difference, and GOES-based IFR Probabilities, all at ~1015 UTC on 22 January. Two things to note: MODIS has cleaner edges to fields, related to the high spatial resolution. The GOES-based brightness temperature difference highlights many more pixels over central Oregon where fog is not present. These positive hits bleed into the GOES-based IFR Probabilities, and they occur because of emissivity differences in very dry soils (See for example, this post). As drought conditions persist and intensify on the west coast under the longwave ridge, expect this signal to persist. The signals are not apparent in MODIS or VIIRS brightness temperature differences because of the narrower spectrum of those observations. Fog persists in the Snake River Valley and elsewhere. 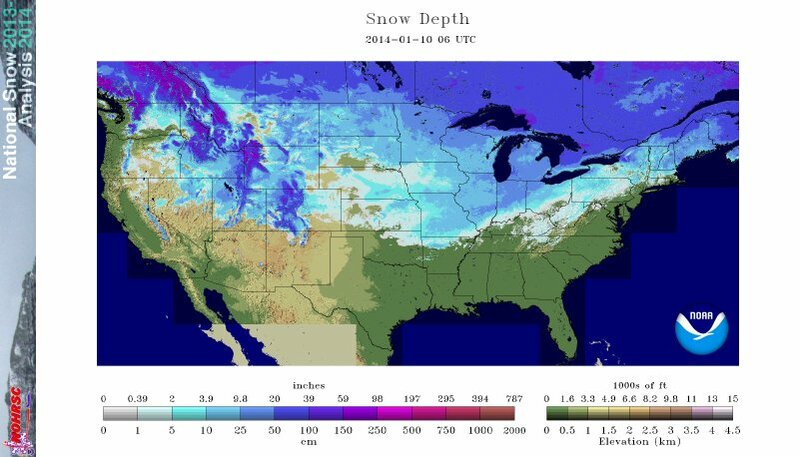 It has also become more widespread over the high plains of Montana. 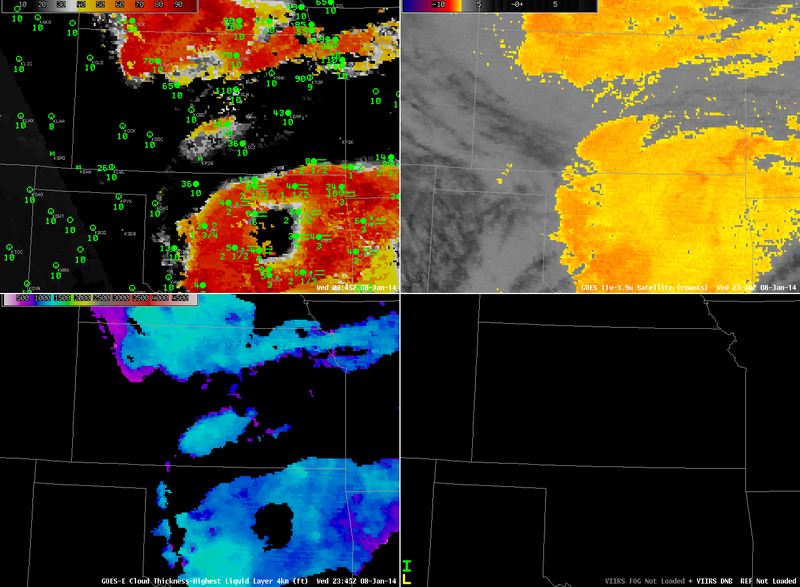 Note the difference in the Day/Night band imagery below. At 0834 UTC, the rising quarter moon is unable to provide a lot of illumination; by 1015 UTC, however, the moon is illuminating the large areas of fog. Because the moon is waning, however, Day/Night band imagery will become less useful in the next week. A toggle between the 1015 UTC Day/Night band and the GOES-R IFR Probabilities computed using GOES-West (below the Day/Night band imagery) continues to demonstrate how well the field outlines the region of IFR conditions. This entry was posted in Day/Night Band, MODIS, Pacific Northwest on January 21, 2014 by Scott Lindstrom. Frontal zones are often accompanies by lower visibilities, and the image above shows how IFR Probabilities march steadily eastward as a front marches eastward across the southern Gulf states. Thus, the IFR Probabilities can, at times, serve as a proxy for a frontal zone. This entry was posted in Deep South on January 21, 2014 by Scott Lindstrom. The image above documents the GOES-R IFR Probability field during a fog event over the East Coast. Note how the IFR Probability field shows more horizontal uniformity than the traditional brightness temperature difference field over eastern Pennsylvania (where IFR conditions are reported). For example, both Selinsgrove along the Susquehanna and Reading in south-central Pennsylvania report IFR conditions in regions where the IFR Probability field has a strong return, but where the brightness temperature difference field’s diagnosis is less certain. The Suomi/NPP field demonstrates the importance of higher resolution from polar orbiting satellites. Both the Day/Night Band and the brightness temperature difference fields suggest the presence of river valley fog over the West Branch of the Susquehanna and its many tributaries in central Pennsylvania. This continues at 0743 UTC, below, when Suomi/NPP’s subsequent overpass also viewed the Susquehanna valley. At both times, the river fog is too small-scale to be detected with GOES-13’s nominal 4-km pixel size. The animation of the fields, below, done to demonstrate the importance of GOES-13’s temporal resolution, shows how the GOES-R IFR Probability field accurately captures the extent of the fog, even as the sun rises and causes the sign of the brightness temperature difference to flip. The traditional brightness temperature difference field has difficulty both in maintaining a signal through sunrise, and it diagnosing the region of fog/low stratus over northcentral Pennsylvania in and around the Poconos and in the Susquehanna River valley. The IFR Probability field has a minimum over/around Mt. Pocono, where IFR conditions are not observed until close to sunrise. IFR probabilities are small over Altoona, where the brightness temperature difference field shows a strong signal developing late at night (and where observations suggest an elevated stratus deck). In this region, although the satellite suggests fog might be present, model conditions do not agree, and IFR Probabilities are correctly minimized. GOES-R Cloud thickness suggests that the thickest blanket of fog is over New Jersey. This diagnosis continues up through the twilight conditions of sunrise, at which point Cloud thicknesses are no longer diagnosed. This entry was posted in Appalachia, Cloud Thickness, Day/Night Band, Mid-Atlantic, Suomi/NPP on January 15, 2014 by Scott Lindstrom. The northward movement of moist air over a snow-covered surface allowed for widespread advection fog in the midwest overnight from January 9th to 10th. The animation, above, shows GOES-R IFR Probabilities at 2-hour time steps. Included in the plots are surface observations and cloud ceilings (documenting the widespread region of IFR conditions) and the RTMA Dewpoint analysis that shows the slow northward movement of dewpoints at the surface. As this moist air moves over the cold snow-covered surface (the snow analysis from the National Operational Hydrological Remote Sensing Center is below), advection fog is a result. The GOES-R IFR Probability fields do a fine job of outlining where the IFR conditions are observed. Note in the animation above how the presence of higher clouds moving up from the southwest affects the IFR Probability fields. As high clouds overspread the advection fog, satellite data can no longer be incorporated into the GOES-R IFR probability algorithm, and IFR Probabilities drop, in this case from values near 90% to values near 55%. Polar-orbiting data can also give information about low clouds and fog. Temporal resolution is far superior to geostationary, as shown below. In cases of small-scale fog, polar orbiter data can give important information by identifying the first region of a developing fog. In large-scale cases such as this, high-resolution data can better identify edges to the fields. The MODIS data in this case does show high probabilities over the midwest; the brightness temperature difference field shows evidence of high clouds from central Iowa southwestward. As with the GOES data, the presence of high clouds results in lower IFR Probabilities. Suomi/NPP data, below, from the Day/Night band shows widespread cloudiness over the midwest. The clouds are illuminated by the moon, nearly full, setting at this time in the west. Shadows are being cast by high clouds on the lower clouds over western Minnesota. The brightness temperature difference fields from Suomi/NPP are very similar to the MODIS data. In contrast to MODIS, the VIIRS instrument does not have a water vapor sensor, so the IFR Probability algorithms are not directly transferable to Suomi/NPP VIIRS data. This entry was posted in Day/Night Band, Midwest, MODIS, Suomi/NPP on January 10, 2014 by Scott Lindstrom. IFR Conditions developed over portions of Kansas and Oklahoma (and adjacent states) overnight. How did the GOES-R IFR Probability field diagnose the development of this event? At ~0000 UTC, the traditional method of low stratus/fog detection (Brightness Temperature Difference) showed two regions over the Plains, one centered over Oklahoma, and one over the Kansas/Nebraska border. IFR Probabilities at the same time covered a smaller area; Wichita in particular had low IFR Probabilities despite a brightness temperature difference signal, and Wichita did not report IFR conditions at the time. Note that high clouds are also present in the Brightness Temperature Difference field over western Kansas, the panhandles of Texas and Oklahoma, and New Mexico. In the enhancement used, high clouds are depicted as dark greys. By 0200 UTC (above), the high clouds have moved over parts of Oklahoma and Kansas. Consequently, there are regions over central Oklahoma and south-central Kansas where the brightness temperature difference field is not useful in detecting low stratus/fog that is occurring. The IFR Probability fields suggest the presence of low clouds despite the lack of satellite data because the IFR Probability Field also uses output from the Rapid Refresh Model that suggests saturation is occurring in those regions. Model data are also used where satellite data suggest low clouds/stratus are present to delineate where surface ceilings/visibilities are congruent with IFR conditions. As at 2345 UTC, Wichita is not reporting IFR conditions, although the brightness temperature difference field suggests IFR conditions might exist. The IFR Probability field correctly shows low values there. 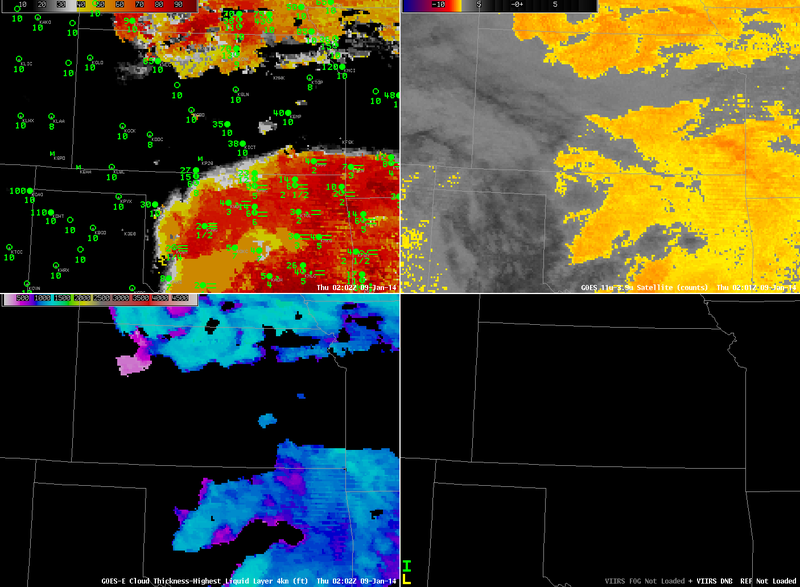 By 0802 UTC, high clouds have overspread much of Oklahoma, yet IFR conditions are occurring at several locations. IFR probabilities nicely depict the widespread nature of this IFR event. Probabilities are reduced in regions where high clouds are present because the algorithm cannot use satellite predictors of low clouds/stratus there. Both the Day/Night band and the brightness temperature difference field give information about the top of the cloud deck — it’s hard to infer how the cloud base is behaving. The addition of Rapid Refresh model information on low-level saturation helps better define where IFR conditions are present. By 0945 UTC, above, the time of the next Suomi/NPP overpass, the high clouds have started to move eastward out of Oklahoma. Consequently, satellite data can be used as one of the predictors in the IFR probability field, and IFR Probabilities over Oklahoma increase. By 1215 UTC (below), higher clouds have east out of the domain, and IFR Probabilities are high over the region of reduced ceilings/visibilities over Oklahoma. The algorithm continues to show lower probabilities in regions over Kansas where the Brightness temperature difference signals the presence of low stratus/fog but where IFR conditions are not present. Again, this is because the Rapid Refresh model in those regions is not showing low-level saturation. Note in the imagery above how the presence of high clouds affects the GOES-R Cloud Thickness. If the highest cloud detected is ice-based, no cloud thickness field is computed. GOES-R Cloud Thickness is the estimated thickness of the highest water-based cloud detected. If ice clouds are present, the highest water-based cloud cannot be detected by the satellite. Cloud Thickness is also not computed during twilight conditions. Those occurred just before the first image, top, and about an hour after the last image, above. This entry was posted in Cloud Thickness, Day/Night Band, Plains, Suomi/NPP on January 9, 2014 by Scott Lindstrom. The coldest air of the season has plunged into the central part of the US. And as noted before, extreme cold does have an influence on the IFR Probability fields because of how the pseudo-emissivity is computed. Consider this effect of cold on the fields as you interpret them. Note also that in the daytime, when visible imagery can be used to augment the cloud mask, IFR Probabilities are low in very cold airmasses. This entry was posted in Error Explanations, Northern Plains on January 6, 2014 by Scott Lindstrom. One benefit of the GOES-R IFR probabilities is its consistency from hour to hour. In the animation above, the region of higher IFR Probabilities associated with a southward-propagating front over Oregon shows good hour-to-hour consistency. In contrast, the Brightness Temperature Difference field (upper right in the figure) suffers from the presence of higher clouds (denoted in the enhancement by darker regions). As the high IFR Probabilities expand southward into southern Oregon, reported visibilities/ceilings decrease towards IFR conditions. In the animation, regions of high clouds show up in the Cloud Thickness product as regions of missing data: Cloud Thickness is of the highest water-based cloud. If the highest cloud detected by satellite is mixed-phase, or ice, Cloud Thickness is not computed. Cloud Thickness is also not computed in the 1600 UTC imagery because that time is near sunrise, and cloud thickness is not computed in twilight conditions. Suomi/NPP provided a view of the scene as well, and the Day/Night Band showed the band of frontal clouds well. The brightness temperature difference field suggests that the cloud band was not necessarily low cloudiness, although the higher IFR Probabilities (and reduced ceilings and visibilities) testify to the presence of low clouds underneath the middle- and higher-level clouds. This entry was posted in Day/Night Band, Pacific Northwest, Suomi/NPP on January 3, 2014 by Scott Lindstrom.